It’s been a big year for Canberra fashion. After Fashfest did so well to spread the word of local designers, a slew of collections have appeared in-store and online, and more! Tonight, at The Hub (a shopfront worthy of an article in itself) another of Canberra’s favourites, Frieda Rome, will relaunch her online presence with something of a soiree in the city. We love the classic lines Freida employs in her selections, very feminine and flowing with bright bold prints harking back to the Golden Days of Hollywood. “My biggest point of difference is vintage silhouettes and designs that are wearable daily, I have selected garments reminiscent of a bygone era. 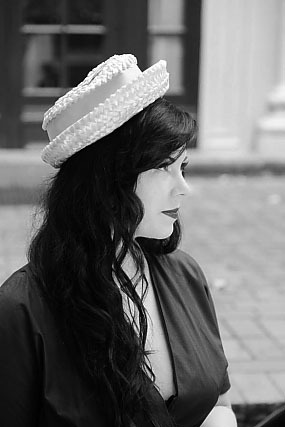 As a lover of millinery I wanted to bring quality vintage hats to Canberra and again do it in a way that is complimentary with today’s fashions. We’ll check it out, snap some piccies and report back soon. In the meantime, check out Freida’s website and social media sites below.